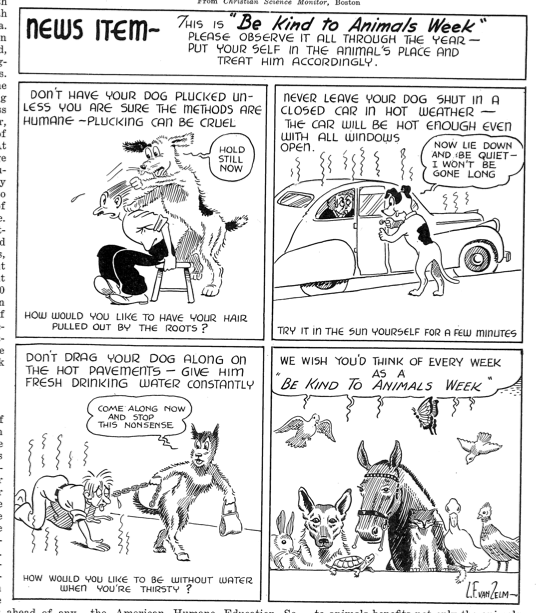 Cartoon published in the June 1941 issue of Our Dumb Animals. Collection of MSPCA Angell. The final panel depicts a number of animals asking the viewer to consider being compassionate towards animals all the time, not just during Be Kind to Animals Week®. This final panel was used in other Humane Education contexts, including on a Be Kind to Animals Week® blotter from 1942. I do not know what dog plucking is, but it’s pitiful to realize that seventy years later, people still don’t get it and leave their dogs in hot cars and let them go without water on a summer walk. BTW, dogs’ skulls are very thin, like infants’ skulls, and they are particularly susceptible to heat stroke. It’s a good idea not just to make sure that your dog has drinking water on a hot day outdoors, but also to wet down his head, back, and paws every so often.